The Liberty 1-1/4 in. Satin Nickel Round Knob adds elegant style to your cabinetry. The smooth finish and traditional design complement any decor. Comes with 8-32 in. x 1 in. machine screws. Inspired by vintage industrial décor, the 1.25inch Industrial Round Knob from Liberty Hardware adds a refined finishing touch to your kitchen. The sleek design and intricate details are reminiscent of vintage piping, while the Warm Chestnut finish gives the look of aged authenticity. Ideal for both kitchen and bathroom decor, or for furniture makeovers. From Liberty Hardware, the Ceramic Pumpkin knobs gives your cabinetry a fun splash of color. The substantial ceramic design offers a sturdy feel and installs easily without the need for cutting. This design is ideal for furniture makeovers or bathroom vanities. Garrett 1-1/4 in. Satin Nickel Solid Round Cabinet Knob The Liberty 1-1/4 in. Satin Nickel Round Knob adds elegant style to your cabinetry. The smooth finish and traditional design complement any decor. Comes with 8-32 in. x 1 in. machine screws. Garrett 1-1/4 in. 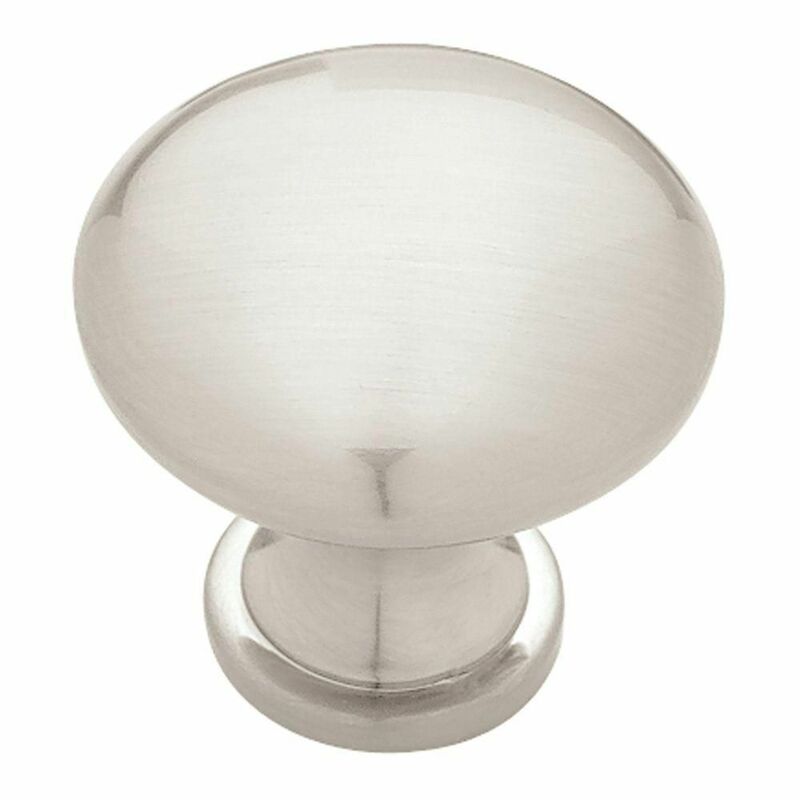 Satin Nickel Solid Round Cabinet Knob is rated 4.9 out of 5 by 23. Rated 5 out of 5 by Bob from Very nice product, is solid so it has a nice hefty feel to it. Installed easily and matches my st... Very nice product, is solid so it has a nice hefty feel to it. Installed easily and matches my stainless appliances and sink. Rated 5 out of 5 by Barbara from These knobs are very nice. Well made. ... These knobs are very nice. Well made. Rated 5 out of 5 by Sparky from Fits perfectly with our brushed stainless appliances.... Fits perfectly with our brushed stainless appliances. Rated 5 out of 5 by Handy from Good product, returned for same knob but different finish. Very... Good product, returned for same knob but different finish. Very eas2 to install. Rated 4 out of 5 by Anne from I bought 40 and used 37. Only 1 was defective... I bought 40 and used 37. Only 1 was defective -- the screw did not hold and it was not the screw. Having the set of screws (one long, one short) made installation easy. These are nice and heavy and feel good in the hand when opening doors/drawers. Rated 5 out of 5 by SelfmadeRemodeler from These knobs are well worth the money. They are heavy and well made. We remodeled our entire ki... These knobs are well worth the money. They are heavy and well made. We remodeled our entire kitchen and this was a perfect touch to make it look warm yet sleek. It's amazing what such a small product can do to a ktichen! Rated 5 out of 5 by HomeDepotCustomer from Heavy and strong in addition to a great look. Have... Heavy and strong in addition to a great look. Have bought them before and will again.